MENLO PARK, Calif., Sept. 2, 2015 /PRNewswire/ -- The 2016 Salary Guides from Robert Half reveal U.S. starting salaries for professional occupations are expected to increase an average of 4.1 percent next year. Among the five fields tracked, the technology sector is projected to see the greatest pay gains, with base salaries rising an average of 5.3 percent. Accounting and finance roles followed, with anticipated average compensation increases of 4.7 percent. The creative and administrative professions each registered projected starting salary gains of 3.8 percent, followed by the legal field, with average base pay expected to rise 3.1 percent in 2016. "Organizations continue to compete fiercely for skilled talent, particularly in the areas of big data, compliance and mobile applications development," said Paul McDonald, Robert Half senior executive director. "Managers who keep current on the latest salary and hiring trends can create more attractive job offers and improve their retention efforts." When it comes to keeping the best and brightest, benchmarking compensation is essential, suggests research from Robert Half. Among more than 1,000 professionals polled, 83 percent said a bigger salary would be a top factor prompting them to move to another company. The research also revealed that it would take a 26 percent salary increase, on average, to compel employees to head for greener pastures. Average starting salaries in accounting and finance are expected to rise 4.7 percent next year. Steady demand persists for professionals such as business systems analysts, staff accountants and financial analysts. Individuals with advanced technology skills, certifications and specialized industry experience can command even higher salary increases. 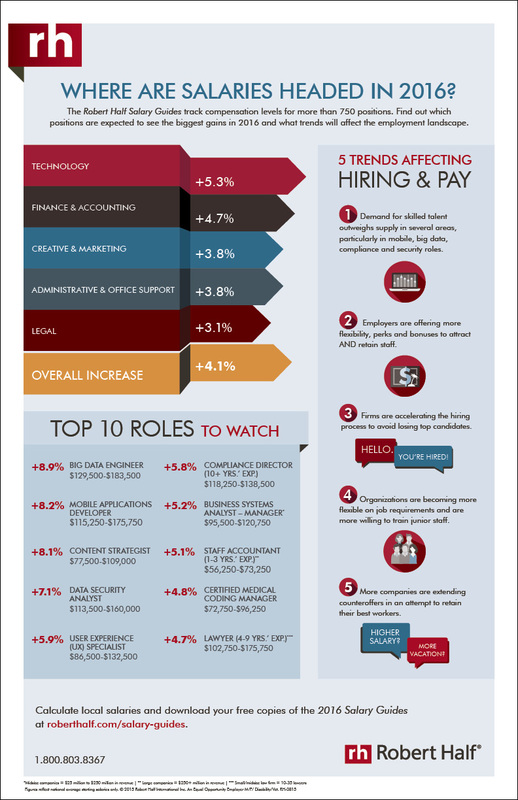 Information technology professionals' starting salaries are expected to increase 5.3 percent in 2016. Firms in a variety of industries seek big data engineers, mobile applications developers and data security analysts to remain competitive, improve customer experience and keep information secure. Wireless networking engineers will see the highest starting salary increase of all the positions included in the 2016 Salary Guides, with projected starting compensation levels rising 9.7 percent in the coming year. Creative and marketing staff can expect average starting salary gains of 3.8 percent next year. Content strategy and mobile development roles are in particularly high demand as organizations focus heavily on initiatives that enable them to connect with customers anytime and anywhere. Overall starting salaries for administrative professionals are expected to rise 3.8 percent in the coming year. As business picks up, firms are bringing on administrative staff to keep things on track, and seek human resources workers to assist with hiring and retention. In addition, continued changes in the healthcare industry are resulting in greater demand for those in coding and customer-facing roles. In the legal field, next year's starting salaries are anticipated to rise 3.1 percent. Increased litigation is driving up demand for lawyers and paralegals with backgrounds in insurance defense, commercial litigation and medical malpractice. Commercial law and compliance are particularly strong areas for legal hiring. The full 2016 Salary Guides -- along with calculators that adjust salary ranges for local markets -- can be accessed at roberthalf.com/salary-guides. Robert Half has reported on salaries yearly since 1950. The company gathers data from its specialized recruiters throughout its U.S. offices to compile the Salary Guides. Information in the guides is based on the thousands of job searches, negotiations and placements managed each year by Robert Half's staffing and recruiting managers, along with the company's ongoing surveys of executives. Continuing or ongoing salaries are not reported because many external factors -- such as seniority, work ethic, job performance and training -- impact the salaries of full-time professionals as work histories develop. Robert Half has more than 340 staffing locations worldwide and offers online job search services on its divisional websites, all of which can be accessed at roberthalf.com. For management and career advice, visit the Robert Half Blog.